Our fab friend, Andrea has started a wonderful shop called, Fabric Envy. Fabric Envy is dedicated to bringing you a seamless shopping experience. It's your one-stop shop for fabric yardage, pre-cuts, fat quarter bundles, half yard bundles, and notions like fabric flowers, buttons, ric-rac, elastic, crochet lace, bias tape and more. The great thing is the shop has pretty much every top fabric designer you can think of! Fabric Envy also works to provide you with all the information you need for quality sewing projects with pictures, craft tutorials, free patterns, designer fabrics, and sewing patterns from the industry's top designers. Sounds pretty perfect to me! I love so many of the collections. 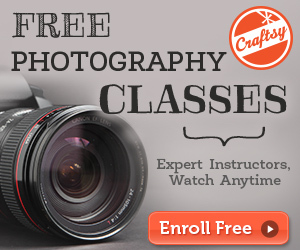 Fabric Envy also has a great vendor program you should know about! If you own an Etsy, Ebay, Artfire, or other shop and use designer fabrics to make your products then you are eligible to apply. Some of the benefits include 15% off everything in the shop (always! 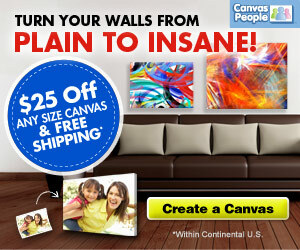 ), and $5 discount code per quarter! Purchase a 3 yard cut or more of any single fabric print and receive an additional 5% off of that fabrics price per yard. 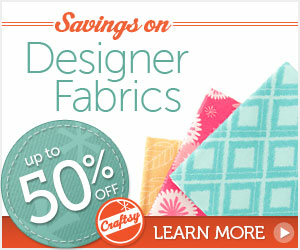 That means you can save upto 20% off on cuts 3 yards or more (discount will be given via price adjustment after check-out, upon yardage verification), and for every approved person you refer to the Fabric Envy Vendor Program, you'll receive a free fat quarter credit once they make their first purchase. Your fat quarter will then be sent with your next order. There is more too! Go check out the vendor program page to apply. See the lovely products pictured above? Ya, one of you gets to win those! A Paris Apartment FQ bundle, a flower from Basic Grey, and a yard of the Riley Black Crocheted Lace in Teal. 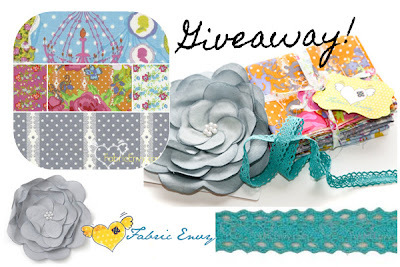 All you need to do to enter is visit Fabric Envy and find your favorite item. Then come back and tell us what is is! For a second entry you can like Fabric Envy on Facebook and for a third entry you can follow Fabric Envy on Pinterest (leave us comments saying you did so). Good Luck! This giveaway will end Thursday, December 8th at 11:59pm PT. However, all of the fabrics are stunning! I am totally in love with the Alphabet Soup by Zoe Pearn for Riley Blake Fat Quarter Bundle. There were so many things on that site that it was hard to choose but this is my favourite. Love this new collection, Modern Whimsy by Laurie Wisbrun. Liked Fabric Envy page on FB. 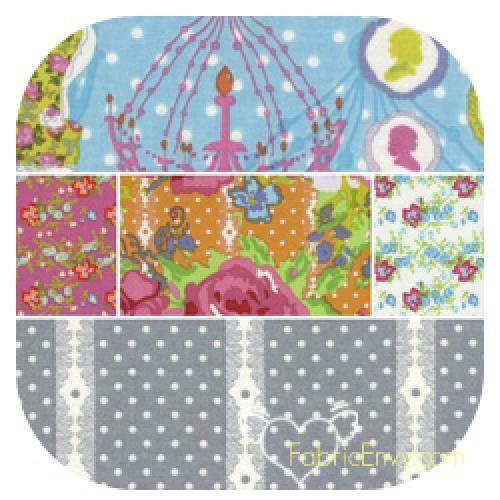 I like the "England Swings by Rebekah Merkle for Timeless Treasures Fat Quarter Bundle". So pretty! Is it open only to USA? I like them all, but I really like the portobello alice kennedy fabric. Love Organic Pick a Bunch!!! How do you pick just one favorite item? The first "wow" I came across would be The Bibury Capelet pattern. There is just too much to pick only 1! I "liked" Fabric Envy on FB. I am now following Fabric Envy on Pinterest. Like the Variety at this site! Organic "pick a bunch" was one of my fave's. 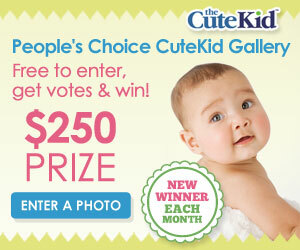 I'm keeping my fingers crossed for this wonderful giveaway! Fav item might just be the Ruby Charm Pack - great colours! I like the Alphabet Soup! following andrea (fabric envy) pins! I like the portobello FQ bundle - great selection, thanks for sharing! Though it's not my normal style, I'm loving the remix collection! I love the pattern for mary janes and fingerless gloves! Wow, there is so much to like. I don't know if I can pick my favorite but I do love the Amy Butler fabric! 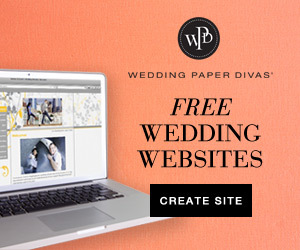 I liked Fabric envy on facebook! Oh, to choose a favorite! I think Happy Little Apples Aqua Appleville Suzanne Ultman. Love it! I like Fabric Envy on FB! I follow Fabric Envy on Pinterest! I love love love paris apt powder blue. So chic! I love the "Pick a Bunch"
I would love any of the fabric bundles. They are all beautiful. (jelly rolls, layer cakes, etc). I have never bought one before and I think that has been a mistake so I would love to win! Super hard to pick only one item!! But I am really wanting the LouLouthi Jelly Roll! Liked Fabric Envy on fb! Absolutely Love the Alphabet Soup by Zoe Pearn for Riley Blake Fat Quarter Bundle... adorable!! I'm redoing my bedroom in greys and I love the Foulard Grey Portebello print. Thanks for the giveaway! I like Fabric Envy on Facebook! Wonderful giveaway. I like Sandi Henderson's Secret Garden fabric. I've got to get some little boy sewing done for our upcoming addition. I love the organic cars print in Bermuda. Thanks for the giveaway! Ok, I went through and found my fabric fav's (love the Peacock Feathers Sea Glass by Amy Butler). Then I found the notions. That XOXO bias binding is wonderful! I love the Prince Charming FQ bundle! I am following on Pinterest! I love the Children at Play line of fabrics. Thanks for the giveaway! I love anything in the alphabet soup line! It's fun!! I love all of the fat quarter bundles! But I especially like Secret Garden! Gorgeous fabric overload! But I think my very favorite (at the moment-subject to change at any time!) is Alphabet Soup in White Zoe Pearn for Riley Blake. Thanks for an awesome giveaway! Love Organic Pick a Bunch! What a great site!! Hard to pick a favorite, but I love the pattern for the adorable baby boots! (Three Button Boots by IThinkSew). I love that the download patterns list exactly what's needed in materials. I will definitely be back to visit this site! I'm loving the Coquette Pat Bravo collection! I could make the cutest aprons out of that fabric! 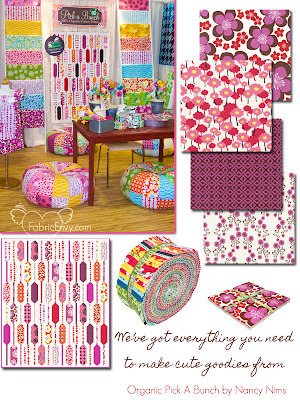 "Liked" Fabric Envy on Facebook! I am loving the Organic Cars Bermuda Ready, Set, Go! Ann Kelle fabric. Medallion Navy Portobello is so beautiful. I would love to get any of the bag patterns and make one with that fabric. I love all the bright colored fabrics! Can't wait to order some!!! Liked fabric envy on Facebook! I just cannot decide between the 3 Button Boots and the Annabelle Baby Sandals...sooo cute!! I love the Secret Garden line by Sandi Henderson! The fabrics are beautiful to look at! I liked Fabric Envy on FB! Alphabet Soup Zoe Pearn is so cute! I love the Peacock Lane line by Violet Craft! I like alphabet soup layer cake collection. Following fabric envy on pinterest. Little Apples Layer Cake by Aneela Hoey is great, but I like the Organic Pick A Bunch you showed even better. Very pretty collections! I am following Fabric Envy on Pinterest. Looking forward to great ideas! I am following FE on Pinterest! Yay! I'm new to all this and totally in love with it all! Especially the Alice Kennedy and Amy Butler fabric. But the Fat Quarter bundles are great too! How do you ever choose? So glad I found you! I'm loving the dew drop fabrics! how cute would the laminated version be for a raincoat??? and I followed on Pinterest! Love secret garden fabric by Sandi Hendeson for Michael Miller. that alphabet soup layer cake from the Riley Blake collection is too cute for words. I have just the project for it too. I also found my favorite product although it was a hard choice to make...Children at Play is just an adorable collection. I like the Cozy Homes Bright Appleville Suzanne Ultman!! I am loving the Prince Charming charm pack! i LOVE Heirloom Fat Quarter Bundle Entire Collection Joel Dewberry for Free Spirit. I like Fabric Envy on Facebook, thank you! 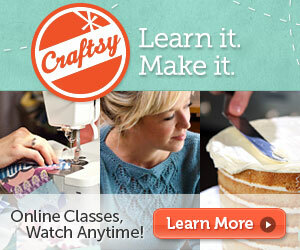 I am following Fabric Envy on Pinterest, thank you! Im loving Daisy Cottage by Lori Holt Pre-Cut Fat Quarter Bundle Entire Collection! Thanks for a great giveaway and Happy Holidays!!! I Liked Fabric Envy on FB...Happy Holidays! Im following Fabric Envy on Pinterest...Happy Holidays! I'm loving the Portabello collection for Timeless Treasures. The colors are absolutely gorgeous! i like the organic "pick a bunch". Following Fabric Envy on Pinterest!!! 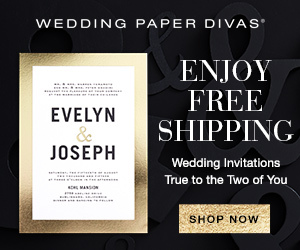 My favorite item from their online store is Overlay in Cream Sophie by Chez Moi for Moda!!! SO pretty!!! I love the Vintage Flutter Dress pattern. Cute! Following Fabric Envy on FB. The Remix Ann Kelle fabrics would make the cutest bow ties for my little boys. Thanks for the great prize. I love the Sophie group. I like Fabric Envy on FB. Alphabet Soup in White Zoe Pearn for Riley Blake is a beautiful fabric. The Argyle Chocolate Remix fabric is perfect! Love it! I love the white linen clothes in Little Apples also the Pooches and Pickups is fun! Thanks for the giveaway! Really beaytiful fabrics! Hard choice but I'll go with Alphabet Soup in White! Wow, there's so many choices. I really liked Alphabet Soup in White Zoe Pearn for Riley Blake. I especially love the Organic Good Life by Wooster and Prince for Robert Kaurfman Fat Quarter Bundle, lovely! I LOVE the Anne Kelle Fabric and would make something for my sister who is having a boy next year! 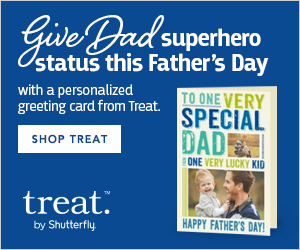 Great give away! I love the elephants run fabric by Tina Givens. I love/want every single print from the Modernology line from Pat Bravo. She's got a lot of great fat qtr. packs there for good prices. I Liked Fabric Envy on Facebook and let her know you sent me! I'm Following FE on Pinterest. And I have liked on Facebook, thanks again!! I love the Curio by Basic Grey for Moda Fat Quarter Bundle. I follow Fabric Envy's pinterest. I love the Daisy Cottage collection! Alphabet Soup would be a darling collection from which to choose fabric for a quilt for my new granddaughter. What fun that would be! Thanks for the chance to win! I love the trucker stripe! Hard to choose a favorite, though. Lots of cute choices. I like the Secret Garden fabric! I'm loving Meadow Gray Peacock Lane Violet Craft! So cute! I love the Prince Charming collection by Tula Pink! I am now following Fabric Envy on Facebook! I like the Secret Garden by Sandi Henderson for Michael Miller Fat Quarter Bundle. I'm in love with the Organic Ready Set Go collection by Anne Kelle. My son is into all things that go and it's so nice to see a great collection for little boys. I like her fabrics for boys. However, all of the fabrics are beautiful! 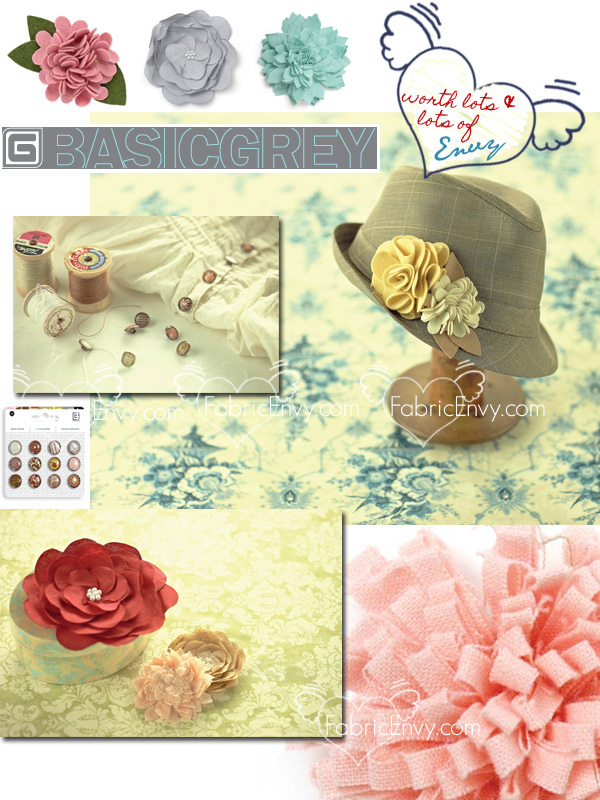 I love the fabric called Linen Muslin Curio by Basic Grey for Moda! Amy Butler Fabric for me please! I love the AMH bias binding! I love the "Children at Play" fabric by Sarah Jane. absolutely love the collection hyperreal garden!!! awesome website! best collection of fabrics i have seen!! 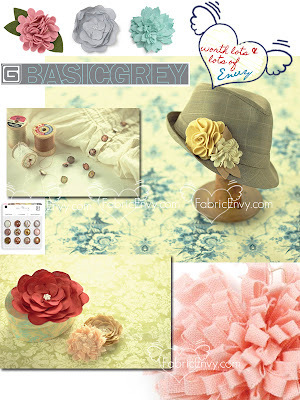 I love curio by basic grey! thanks! I am in love with the Portobello by Alice Kennedy. I love the Alphabet Soup collection, it would be perfect for a quilt for my sister's first girl- due in 1 week! my fav is potobello! i can see myself making some cute wristlets with that fabric!! i love Tulia Pink's collection! Portobello by Alice Kennedy for Timeless Treasures is awesome as well as Remix by Anne Kelle - but then all of it is sooo beautiful it's really hard to choose! I also liked Fabric Envy on Facebook! 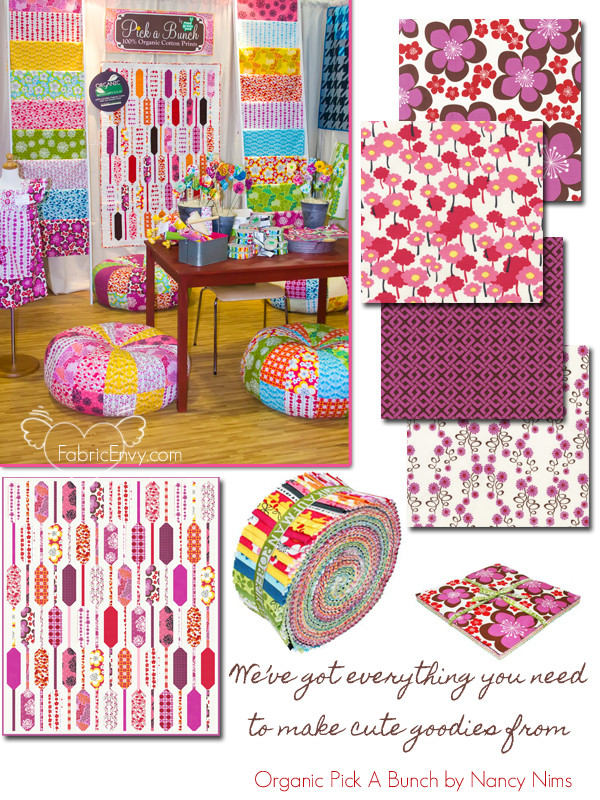 I like the Organic Good Life Collection Jelly Roll and of course, the Sweetwater fabrics! I like Fabric Envy on facebook. Also following them on Pintrest....thanks so much! Great to know about her store! My favorites are Bari Js Paris Apartment and the Ruby Bonnie and Camille. I followed Fabric Envy on pinterest too---3 chances to win!!! I LOVE Alphabet Soup Zoe Pearn!!! :) So cute! I love the Anna Maria Horner Bias Tape. (and every scrap of fabric they have).